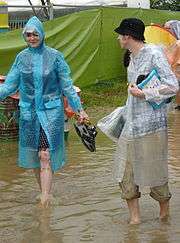 A cagoule, cagoul, kagoule or kagool (from the French cagoule meaning balaklava) is the British English term for a lightweight (usually without lining), weatherproof raincoat or anorak with a hood, which often comes in knee-length. The American English equivalent is windbreaker; the Canadian English equivalent is windbreaker or K-Way; the Australian English equivalent is parka . In some versions, when rolled up, the hood or front pocket doubles as a bag into which the rest of the coat may be stowed. A cagoule which can be rolled up into a very compact package and carried in a bag or pocket was invented by Noel Bibby and launched in the UK under the brand name Peter Storm in the early 1960s. Bibby was a former marine and patented his design, which is thought to be the original. In 1965, the French cagoule brand K-Way was introduced. Original versions of the lightweight and packable mac generally had an integral hood, elasticated or drawstring cuffs, and a few poppers (snap fasteners) or a short zip at the neck. Usually, the cagoule could not open fully at the front and was pulled on over the head. It became very popular in the United Kingdom during the 1970s, going by trademarks such as "Pac-a-Mac" and "Cag in a Bag". The packable cagoule was described in the 1981 Madness song Pac A Mac with the words: "When it rains, Cats and dogs, From my pocket I pick a pac-a-mac". 1 2 3 Leitch, Luke (25 April 2014). "How the cagoule became too cool for school". Daily Telegraph. Retrieved 26 June 2015. ↑ "Pac A Mac". madness.co.uk. Madness. Retrieved 26 June 2015.